The full list of this year’s RPG-inspired questions. 10: Largest in-game surprise you have experienced? Playing Rifts, I was most surprised the moment that it was revealed that my Dog-Boy, Asher, just unwittingly became a Paladin of the archangel Gabriel. We had no idea that old Gabe was Gabriel, and I certainly wasn’t expecting a whole slew of new abilities (and responsibilities). 11: Which gamer most affected the way you play? Definitely my Dad. He was my first DM, and as such really shaped the way I play and the way I run campaigns myself. I haven’t played more than a couple of games without him, actually, and I’m glad to be influenced by his easygoing and creative style. I have my own style, of course, but without Dad introducing me to RPGs and gaming with me on the regular, I’d be a very different gamer. 12: What game is your group most likely to play next? Why? 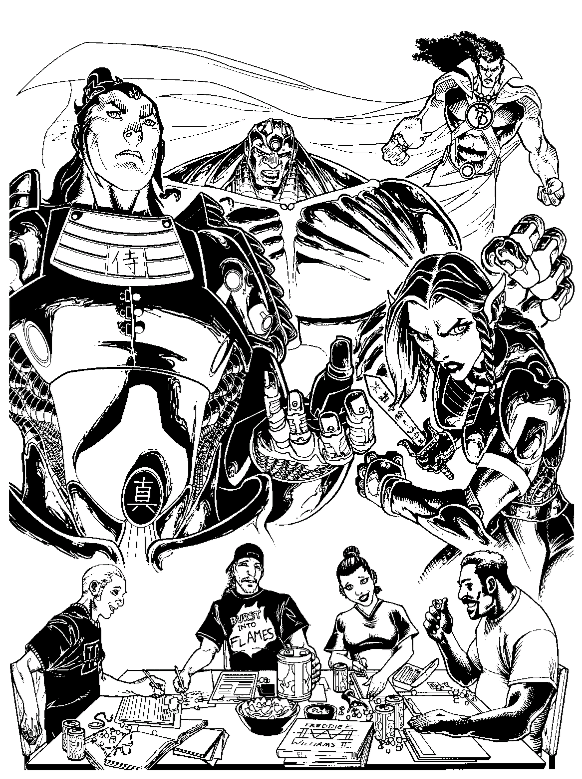 Rifts, which is what we always play because we love the setting and world created by Palladium Books. Also because I won’t have my physical copies of Savage Worlds: Rifts until December, and we’re trying to set up a game before that. Same beloved setting, but with the streamlined SW rules. However, we’ll have a new player, too. So I’m going to try my hand at convincing the group to run a new system, something less familiar, but far less crunchy. Maybe Wayfarer: Things Beyond Wonder (an indie RPG which I reviewed here) or the World of Warcraft RPG (based off of Dungeons and Dragons 3.5)? RPG a Day: A Whole Month’s Worth of Gaming! A bit late to post, but a similar family emergency as detailed here has cropped up. While we are all shaken, we persevere and make the necessary changes to our life as needed. I will not be putting my weekly posts on hiatus as I dearly need this hobby of mine for stress relief, but I cannot cast aside any chance of troubles meeting my schedule in the future. Things happen, and while we are making every preventative effort we can, more may yet happen. That being said, this was a delight to take part in and to share and relive my personal gaming stories. Much is copied from my personal posts on Google Plus, which you can still find on my profile, but there is much that was lost or not included that I stuffed in here! I hope you enjoy and find yourself reminiscing upon your own gaming (mis)adventures! That would be Rifts by Palladium Books, and I was 17. My Dad was the DM, he had just gotten honorably discharged from the US Navy and he was looking to spend some time reconnecting with me, so he dug out his old copies and we spent about 4 hours going through character creation! My fiancé (now my Husband) was there, too, and while he had played Dungeons and Dragons throughout school, he’d never heard of Rifts and got sucked into it, too. I played a Freeborn Dog-Boy (played in the style of an Operator O.C.C. who specializes in mechanics), and my fiancé played a human Wilderness Scout. The campaign stretched on for a few weeks through nightly sessions, we’d gotten to level 14 or so, until finally Dad devised a player killer ending. We were up against an army of Coalition skelebots, tanks, towers, deathhead transports, SAMAS suits; it was very much meant to end the campaign. While my fiance and the rest of the party were taking down a good amount of baddies with some well timed explosions and great shots, I climbed up a tower with my gigantic wrench, taking pieces off as I went along, until I finally reached the point where I could hack into the terminals. Dad is the type of DM who operates on the belief that anything is possible, even if it’s incredibly unlikely (I got this DM style from him.) I had to succeed at two separate pencentile rolls (with a maxed out skill) and roll really well for both of them. I somehow managed to do it. Then I used the tower to destroy the other defenses and take out droves of baddies, paving the way for a surprise success with my other powerful party members. Dad ended the campaign there because he was not only sick of the campaign itself, but also because he didn’t want to figure out experience. We went out and ordered a book from our local game store within the week and we’ve been playing ever since.